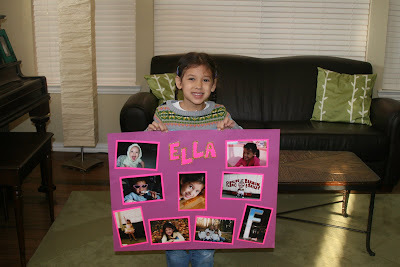 Silly Mommy : Ella is a star! Ella is so excited to be the Star of the Week at her preschool this week. She brought a poster in today that will be displayed in the classroom all week long, she gets to be line leader everyday, she gets to bring a few of her favorite toys/books Wednesday to show her friends and then she gets to bring in a special snack on Friday. I think this is a really neat program that makes the kids feel super special. 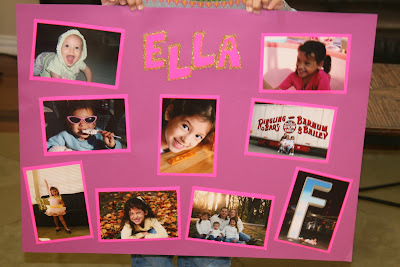 Congrats on being Star of the Week Ella! We love you! Here is a close-up of the poster(I am obviously no scrapbooker!). Glitter, scissors and glue for me! :) It was really hard to narrow down pictures for this poster. Ella is just such a cutie! You were already a star to me! Ella is such a cutie! I love that they do star of the week at school. It's always so fun! You did a great job on the poster! Of course with Ella as the star you couldn't go wrong. She is a very beautiful little girl. I hope she enjoys her week!! Congratulations on Star of the week. 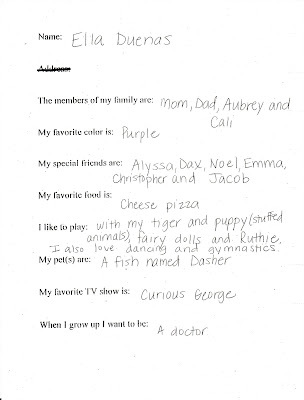 I think you will make a great doctor! Loved the pictures you chose; totally shows her personality! And doctor, eh, awesome!!! We already knew she is a star!! What a wonderful treat for the kids! How fun! She is full of personality! Love it!! and who wouldn't want to be curious george. love doing those posters form my kids- i think it's good for them too! Congratulations Ella. You are so lucky to be the Star of the week woo hoo. Cute pictures wish I could be there to try your special treat your going to bring to school. Have fun. So cute. She's a doll. Yay Ella! She's growing up so fast and so sweet.